45 colleges and universities. 30 award-winning projects. One lasting legacy from Glasgow 2014. In 2014 Universities Scotland and Colleges Scotland partnered to deliver the Game Changer Awards in recognition and celebration of the many ways that colleges and universities were working to contribute to a legacy from the Glasgow 2014 Commonwealth Games. As the Game Changer Awards was all about legacy it is fitting to return to the award-winning projects a year on from the Games to see what impact they are still delivering. The winning projects were able to demonstrate a particular emphasis on the four legacy goals of Glasgow 2014 which were: connected, flourishing, active and sustainable. 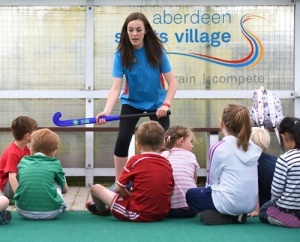 Joanna now has a career as a sports coach at Aberdeen Sports Village following her experience volunteering as part of Aberdeen University’s Commonwealth Sports Tour for school children from P4 to S2. Stirling and Bridge of Allan now has a university and community multi-sport club for disabled users. This grew out of the Disability Tennis Programme that won a Game Changer Award. Students at the University wanted to open up tennis to the local community and the initial project has kick-started a number of parasport activities at Stirling University. It’s hoped this flagship initiative will work to break down barriers and that more disabled people will seek opportunities to participate in sport at the University’s Centre for Sporting Excellence. 90 per cent of the students and staff involved in the Game Changer Awards said that their participation made them feel more involved in the special event of Glasgow 2014. The legacy brochure catches up with 30 award-winning projects across the HE and FE sector one year after the Games.